Rothkase Wisconsin Mountain Cheese for sale. Buy online at Zingerman's Mail Order. Gourmet Gifts. Food Gifts. The name does require a bit of willful ignorance on the part of you, the reader, since there are no mountains to speak of in Wisconsin. 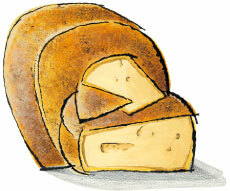 But the cheese is made in the Alpine style of Swiss Gruyère, hence the moniker. It’s produced from raw milk in copper kettles, aged on red pine shelves. In order to select the exact batches of cheese we want, our cheesemonger receives a care package of “plugs” from different days’ productions every few weeks. He samples them all, then picks the batch he likes best. He hit the mark with these: sweet, intense flavor like a great mountain cheese should have, no matter where it's from.